Now Twitter is making the long overdue changes to its Direct Message API that would allow businesses to differentiate between the humans — and even bots — replying to a customer's message. Instead of manually adding a signature to the message, Twitter will automatically display the face, name, and title of the agent speaking. 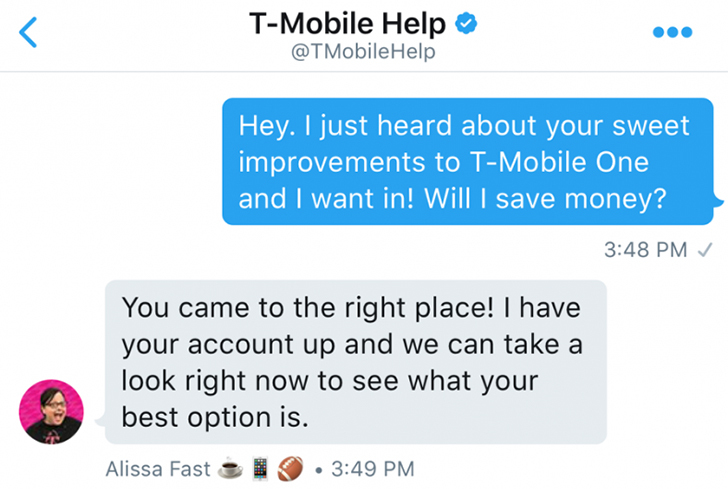 Check the conversation on top (sorry about the iOS screenshot, that's what Twitter provides) to see how a discussion started with @TMobileHelp got an answer from customer care agent Alissa Fast. The feature is still in private beta and the first account to benefit from it is @TMobileHelp. There's no timeline on when it will be available to everyone, but other businesses interested in rolling it out for their support staff can already voice their interest to Twitter and developers who want to add the feature in their apps can apply for access.